Yes, I am an ordained minister through the Universal Brotherhood Movement and I am a graduate and faculty member of Celebrant Foundation and Institute. Will you meet with us prior to the ceremony? Absolutely, as many times as you want. We can also Email and chat on the phone. I will re-write your Ceremony until it is exactly the way you want it! What can we expect at our first meeting? I will bring samples of vows, readings, rituals, a ceremony structure which is a beginning. 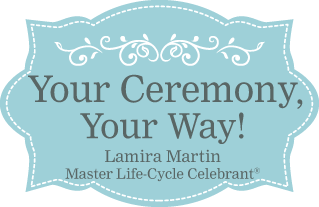 You can change and re-arrange all of the ceremony elements. In your folder there will also be “homework!” No grading!! You will each get a questionnaire to fill out that will help me to get to know you better. You can tell me about how you met and fell in love, what you love about each other, and your future plans. I will write your ceremony from your own words. If you want to secure your date, we can fill out contracts – one for you, one for me and I will accept your retainer fee. If you want to think about it, I will give you a self-addressed, stamped envelope and, if you decide to retain me as your officiant, you can mail the contracts and initial fee to me at a later date. Dates can fill quickly – especially Saturdays. Can you marry us on really short notice? If the date is available, I would be happy to perform your wedding. Costs vary from $80 to $475. I will be happy to discuss payment plans, if your budget is tight. Will I need a rehearsal? Rehearsals are a wonderful way to ensure that everyone will know what they are suppose to do for your big day, but this is up to you. The actual rehearsal usually lasts about 20 – 30 minutes. Please allow about 30 minutes for your wedding party to arrive and have a little time to chat before the rehearsal begins. Ceremonies vary from 5 minutes to 30 minutes and above. What time do you arrive to the ceremony? I will arrive at your ceremony location 30 minutes prior to the scheduled start time. I will check in with the venue manager, give a Q sheet to your musicians and photographer, so they will know what to expect within the ceremony. What if our ceremony is running behind, how long will you stay? I allot approximately 2 hours total for your ceremony. Yes, In fact I encourage you to include your children in the ceremony. I have several beautiful rituals and vows that work very well with children of any age. Children from previous relationships sometimes feel left out and this is a beautiful way to let them know they are a member of this new family. A special gift can be presented to the child at this time. Can our family (parents, grandparents etc.) participate? Yes, I think it is wonderful when many members of your family and/or your friends participate in the ceremony. A member of my family has passed away. Is there a way to honor their memory at the ceremony? There are several options available to remember a family member who has died or who cannot attend your ceremony for any reason. What fun! Yes! But please check with your ceremony venue for their regulations. Do you perform theme weddings? Yes, I can perform theme weddings. One of my favorites was a Pirate Wedding at a Tiki Bar! I wear a black pantsuit, with a black lace jacket or a black dress with lace jacket. Lamira Martin has to be one the best parts of our planning process. From the first phone call to the hug after the ceremony, we could not have asked for more. Her enthusiasm in planning our wedding was unmatched!!! Her responsiveness to our wants, needs and desires made the difference. I had no idea how to "personalize" our wedding. She made the process so simple. We were given numerous choices for readings, vows, ring exchanges and traditions to add to our ceremony. Even though we had only six weeks to plan the entire event, that was plenty of time for my husband and I to read, discuss and make decisions on each of the areas. The response time to emails and phone calls was phenomenal. I have to say that she is a person who takes extreme pride in her work. The wealth of ideas she expresses is unbelievable. Her excitement for the beginning of our new life together was unsurpassed!!! Thank you Lamira....I wish you all the joy for your life that you gave to me on my wedding day.